The Bible, God’s Word is the instruction manual for marriage. God, designed and created the institution of marriage. God honors a holey union. Marriage is the foundation throughout history. But marriage is under attack in our society today. Is your marriage suffering? Learn what God has to say about a successful marriage and how to have one. Only a man and a women can be one flesh—anything else is wishful thinking. Based on what God has created a woman and a man are tailor-made together they are the pinnacle of the created order, both made in God’s image, both coming together to be made one flesh. The Edenic Covenant - 2:15-17, was made between God and Adam in which Adam stood as the representative head of the human race. Thus the actions of Adam are attributed to the whole of humanity. The Edenic Covenant was the basis for the Dispensation of Innocence. But man chose to break that covenant, and Man at that very moment died spiritually and could no longer share the same communion with God he had experienced before his disobedience. With that act, the Edenic Covenant, being conditional, came to an end. The Adamic Covenant became the basis for the Dispensation of Conscience. As an unconditional covenant, it is very much in effect today. What is the purpose of the Garden of Eden? Listen now and see. No delights can be satisfying to the soul, but those which God himself has provided and appointed for it. Eden signifies delight and pleasure. It was perfect, it was a garden paradise—the garden of God. What about today? 1 John 5:11-12 states, “And the witness is this, that God gave unto us eternal life, and this life is in his Son. He that hath the Son hath the life; he that hath not the Son of God hath not the life. “ Today God has asked to believe in God’s Son. God will bless our time here and now and give us eternal life in eternity. Will you accept His provision that leads to eternal life and restoration to His perfect garden in eternity? The Lord God had not caused it to rain on the land, and there was no man to work the ground, and a mist was going up from the land and was watering the whole face of the ground—then God formed man of the dust of the earth. God then breathed the breath of life into the nostrils giving the man spirit and understanding. God created man in His own image; the image of God He created him; male and female. You are wonderfully made. God saw all that He had made, and it was very good! Then God said, “Let the water swarm with living creatures, and let birds fly above the earth across the expanse of the sky.” So God created the large sea-creatures and every living creature that moves and swarms in the water, according to their kinds. He also created every winged bird according to its kind. And God saw that it was good. So God blessed them. The power of God's providence preserves all things, and fruitfulness is the effect of his blessing. GOD Said… let there be lights! We are either surrounded by light or darkness. The creation of the “lights” in the heaven on the fourth day corresponds to the creation of “light” on the first day. If we divide the six days into two groups of three, there are in each group four creative acts, and at the head of each group is the creation of light. What set the stars ablaze and where did the planets come from? God created them all. What are mortal men that He should think of us? Who was God creating all this for? GOD Said… and it was good! When God speaks something happens. We want God to speak to us. When God speaks our lives our impacted. God speaks through His creation. What is God saying to you? What is God speaking through you? In Genesis 1:6-8, We learn that God separated the waters, but just where did all this water come from? How is it that our Earth offers life sustaining water, which is hardly viable or apparent in other planetary systems in the universe in regards to human life? Why is our Earth so special from all other systems in the universe? Learn how the great Almighty God created and set water in motion. Since the sun, moon, and stars were not made until the fourth day, when God said ‘Let there be light’, where did this light come from? God is light. The light denotes the dwelling or settling of the divine presence and glory of God. Through time God’s presence and manifestation has been seen in a cloud, Exodus 13:21-22. By day the Lord went ahead of them in a pillar of cloud to guide them on their way and by night in a pillar of fire to give them light, so that they could travel by day or night. Where is this light now and how is God’s presence manifested in our lives today and in the future? God created everything out of nothing. We live in a time when some wonder, where is GOD? God is a creator of order, not confusion. If Jesus can create everything out of nothing, what can He do in your life? God created everything out of nothing. From what we see of heaven and earth, we learn the power of the great Creator. The Son of God, one with the Father, and the Holy Spirit was with Him when he made the world. The world was made by Him, and nothing was made without Him. 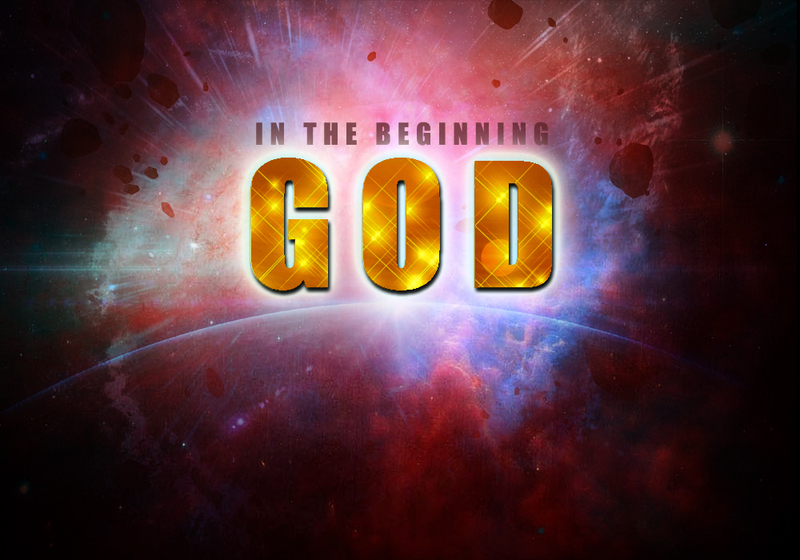 Before time the omnipresent, omniscient, and omnipotent IAM created and set time in motion.